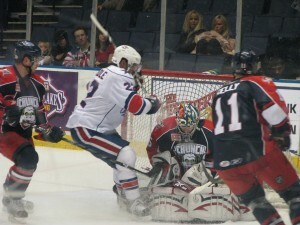 Amerks Led By Brodeur Shut-Out the Crunch · Let's Go Amerks! The Amerks finally snapped a 13 game losing streak against thruway rivals Syracuse Crunch by shutting them out 1-0 at Blue Cross Arena. It was yet another game of stellar goaltending from Mike Brodeur who is now 4-2-0 since joining the team, this being his second shut-out. Mike Brodeur was the first star of the game and also the first star of the day in the American Hockey League with 30 saves on the night. 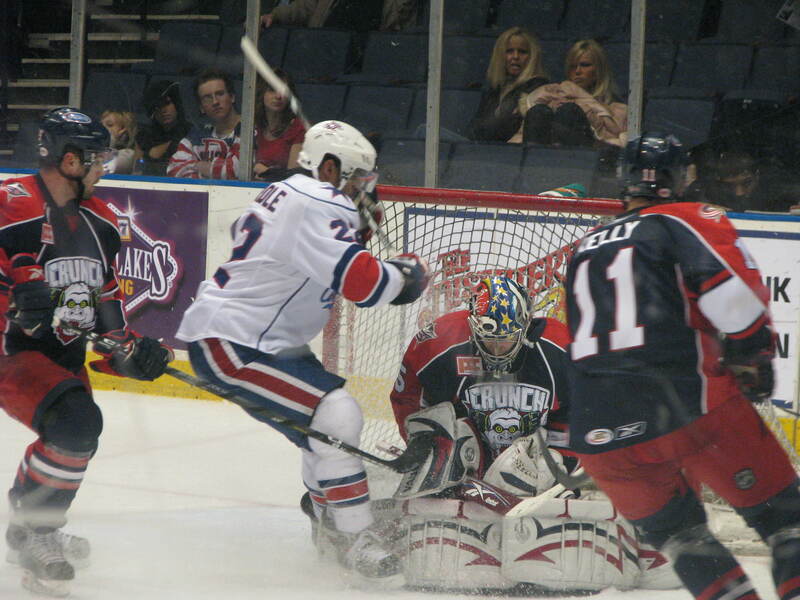 Kenndal McCardle scored the only goal for the Amerks at 7:47 of the first period. The play started when Jacob Micflikier shot the puck from the face off circle, Stefan Meyer grabbed the rebound and put it back on the net where McCardle was able to put it away for his fifth of the season. The Crunch had some decent scoring opportunities, especially in the third period. Derek MacKenzie had a great chance when he took the puck in almost all alone when the Crunch were short handed in the third period, Brodeur made the save but Peter Aston and Noah Welch also showed great hustle getting back and slowing him down. Maksim Mayorov had another great chance after he received an excellent cross ice pass and had a wide open net, but he clanked it off the post instead. Up until recently plays like that would’ve found the net no problem and had the Amerks playing catch up. Tonight it was a combination of the Amerks playing urgency and found a way to win along with the Syracuse Crunch being in a slump. In the past 10 games the Crunch are 2-8, the Amerks in their past 10 are 5-4-0-1. So while the Crunch are in a slide, the Amerks confidence has risen. The plan all weekend had been to play Brodeur twice and Chris Beckford-Tseu once, but Groulx stated that after Saturday nights game against Lake Erie it was obvious Brodeur was getting another start. Groulx said, “we did n0t want to break the team chemistry, he will also have the next start.” That next start will be Friday December 19th against the Lake Erie Monsters at Blue Cross Arena. Everyone is playing better hockey, including tough guy Riley Emmerson. While the Crunch tough guy Jon Mirasty was riding the bench for most of the game, Riley Emmerson was getting regular shifts on the ice and making plays as well. Mirasty did try to get Emmerson to square off in the second period but Emmerson was told to not take part and for good reason.. the Amerks were up 1-0 and the last thing they wanted to do was put any possible energy to the advantage of the Crunch from a fight. Another difference is that the team is getting shots through to the opposing goaltender. Keaton Ellerby and Jordan Henry were the only two Amerks players to not have a shot on goal tonight.. with everyone contributing good things are bound to happen, and they are. For the second night in a row the Amerks penalty killing unit was able to hold off a five on three, this time during the second period. Randall Gelech was already serving a bench minor for too many men on the ice when Drew Larman was called for a hooking penalty. Just as the team seems to have gotten past shooting the puck over the glass for delay of game penalties this is the second time in as many games they’ve been called for too many men, let’s hope this isn’t a new routine forming. The announced attendance was 2,486 but the crowd was probably about half that size. People have probably been staying away from games due to the losing record, but in case you haven’t noticed things have turned around. Let your friends and family know, the season is turning around. I won’t get too far ahead of ourselves, but at this pace we’ll be climbing out of last place in the league and letting someone else hold the prestigious role. The Amerks will have a much deserved day off tomorrow after a grueling seven game in ten day stretch, four of those days involved traveling to and from Texas. – After the game Noah Welch packed his bags to head back to Florida. He said their was no chance his conditioning stint could be extended. – Frank MacDonald sat out his second game in a row with a swollen ankle. – Tanner Glass played his first game back and had three shots on goal. He said Matthias and Repik are doing great in Florida.